Enjoy 9 luxurious nights aboard Royal Caribbean's "Grandeur of the Seas" sailing out of Baltimore cruising through New England and Nova Scotia, Canada. Discover the beauty of the Northeast coast and the brilliant fall foliage colores on this exciting voyage ! No need to worry about flying...we will take you by motorcoach to Baltimore to board Royal Caribbean's "Grandeur of the Seas", your home for the next nine nights. Today, we will board our motorcoach very early this morning and head to Baltimore where we will board our cruise ship today and set sail. At time of print, the cruise ship was scheduled to sail by 4:00 PM, although boarding time is much earlier in Baltimore. Bon Voyage ! This will be a fun day at sea as we head towards New England and Nova Scotia. Port of Bar Harbor, Maine. Port of Saint John, New Brunswick, Canada. Port of Halifax, Nova Scotia, Canada. Estimated times are: 10:30 AM Arrive Halifax / 7:00 PM Depart Halifiax. Fun Day at Sea ! This morning our cruise ship is scheduled to arrive in Balrimore about 7:00 AM where our motorcoach will be waiting to pick us up at the port for our return drive home aftr a fabulous time ! 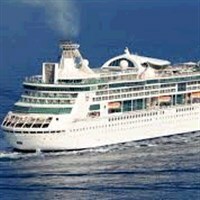 Cost Includes: Round trip motorcoach transportion to and from Baltimore, MD pier, full cruise aboard Royal Caribbean's "Grandeur of the Seas", stateroom accommodations on board ship, entertainment on board, most meals aboard ship, baggage handling, shipboard gratuities, government fees and taxes. Insurance: Travel insurance is optional and must be purchased at time of booking when first deposit is made. Insurance premium is non-refundable. To be eligible for the waiver of pre-existing medical condition exclusion, the protection plan must be purchased within 15 days from the time you make your initial trip depsit and for prepaid non-refundable payments or deposits. If purchased, the insurance premium is refundable during the 15 day review period, unless you have filed a claim or departed on your trip. To view/download the policy go to: http://policy.travelexinsurance.com/312A-1217.